Melvyn Bragg discusses Muslim Spain, a culture that lasted 700 years, from Cordoba’s golden age to the fall of Granada. Melvyn Bragg and guests discuss Muslim Spain. In 711 a small army of North African Berbers invaded Spain and established an Iberian Islamic culture that would last for over 700 years. Despite periods of infighting and persecution, Muslim Spain was a land where Muslims, Jews and Christians co-existed in relative peace and harmony. Its capital, Cordoba, although not unique amongst Spanish cities, became the centre and focus for generations of revered and respected philosophers, physicians and scholars. By the 10th century Cordoba was one of the largest cities in the world. But what some historians refer to as Cordoba’s Golden Age came to an end in the 11th century, when the society was destabilised by new threats from Africa to the South and Christendom to the North. However, it was not until 1492, when Granada fell to the Catholic monarchs Ferdinand and Isabella, that Islamic Spain was well and truly over.In that same year the Jews were expelled from its shores and Christopher Columbus set sail to lead Spanish Christian expansionism into the new world. But how did Muslims, Jews and Christians interact in practice? Was this period of apparent tolerance underpinned by a respect for each other’s sacred texts? 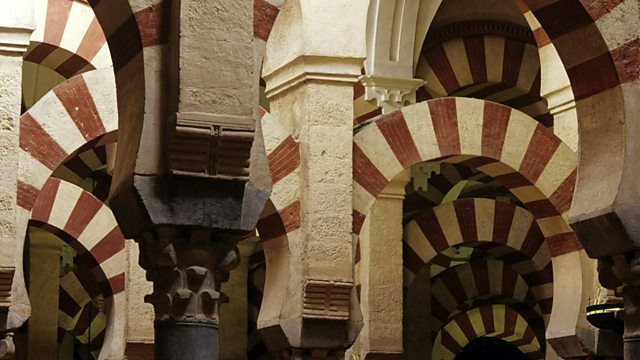 What led to the eventual collapse of Cordoba and Islamic Spain? And are we guilty of over-romanticising this so-called golden age of co-existence? With Tim Winter, a convert to Islam and lecturer in Islamic Studies at the Faculty of Divinity at Cambridge University; Martin Palmer, Anglican lay preacher and theologian and author of The Sacred History of Britain, Mehri Niknam, Executive Director of the Maimonides Foundation, a joint Jewish-Muslim Interfaith Foundation in London.